Oh well done Shea Ernshaw! I was gifted The Wicked Deep a few months ago from my wish list, as it’s cover is stunning! (I’m a sucker for foil, texture, and font haha.) The novel was sitting there, taunting me, so I decided to make it a must read for September. 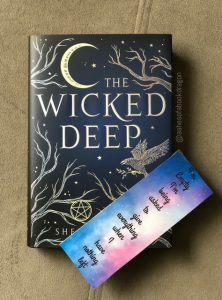 Shea Ernshaw published The Wicked Deep earlier this year, and unlike most YA’s that are being released – IT’S A STAND ALONE BOOK. (My wallet is so thankful right now LOL). The Wicked Deep follows the town of Sparrow, where 3 sisters were murdered centuries ago as witches. Due to this, every year their spirits return and take the bodies of local girls and the souls of local boys. Penny Talbot is caught smack in the middle of what is called the “Swan season’ and must make a choice to save an outsider or herself. Let me start by saying, I ADORED the atmosphere of this book. When starting it, it immediately felt like it should be Halloween or autumn or some sort of chilled evening where I”m peeking through window curtains at fog outside. The setting is that good. The plot for this book is written beautifully. Wicked Deep brought me into the world immediately and kept me wondering through out all of it. Don’t get me wrong, I did guess a few parts but that didn’t take away from the mystery or the ambiance. I read this book in one sitting… it gripped me that hard. The side characters didn’t really play huge role in this book. They were there but they’re very much background. This is probably to illustrate how separate Penny is from those around her. Although, Bo is developed well and so is Penny’s mom. For the ending I would like to say I loved it but I was more okay with it. It does a good job wrapping everything up but I was hoping for a bit more. #greedy hahaha. Honestly, the ending works very well to bring closure and round everything out. Overall, this book was a fast read and really gets the audience in the mood for autumn. The setting is SO WELL DONE.